Today’s modern storage solutions follow the old fashioned rule of three. 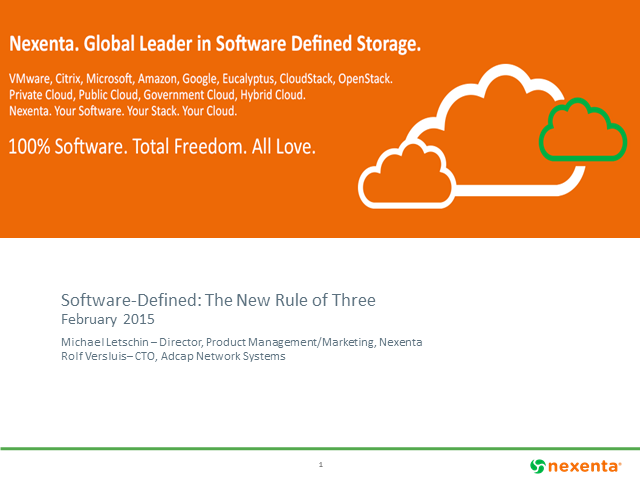 Dominated by three words: Software-Defined Storage. Learn about the trifecta of benefits from efficiency to flexibility to financial responsibility by joining Rolf Versluis, CTO at Adcap, a leading reseller in the SouthEast and Michael Letschin, Director of Products at Nexenta as they discuss the trends and use cases for Software-Defined storage and their play with the major virtualization vendors. - What is the rule of three?